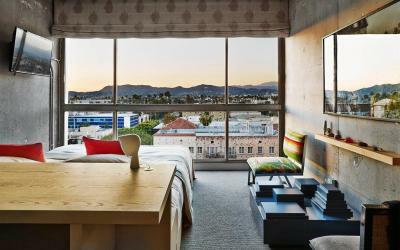 Lock in a great price for The LINE Hotel – rated 8.1 by recent guests! The staff are accommodating, and the restaurant is lovely. The view of downtown, next to eateries and consulate. They are all walking distance with your little kids. The room was nicely decorated with updated furniture. I felt the area was safe for families because there are plenty of security. Ended up needing a place to stay on a whim. Was able to book one night on Booking.com, and when I went in to check in (around 2 AM) with my boyfriend, they were unable to check us in because I accidentally made a mistake with the booking and booked for the following day. They were able to accommodate us and get us a room the night we checked in, and even gave us a free room upgrade to a beautiful suite with a decent view. During our entire stay the staff was so kind, and made everything so effortless for us. Cannot wait to stay again! It was a beautiful hotel with an incredibly wonderful staff! 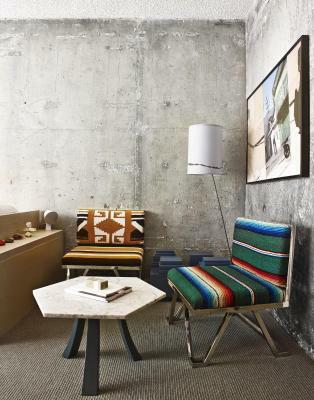 I like the kind of industrial interior of the room. Location is great if you love korean food since it’s located in Koreatown. Pretty close to Lacma. The thickness of the wall, and our view, and it was not a very noisy neighborhood. Great location. I have stayed here before and had high expectations. 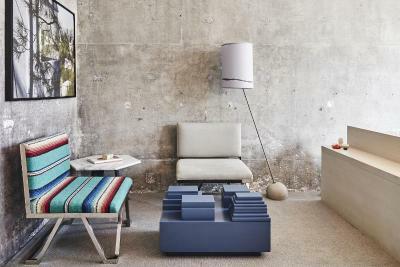 The LINE Hotel This rating is a reflection of how the property compares to the industry standard when it comes to price, facilities and services available. It's based on a self-evaluation by the property. Use this rating to help choose your stay! One of our best sellers in Los Angeles! 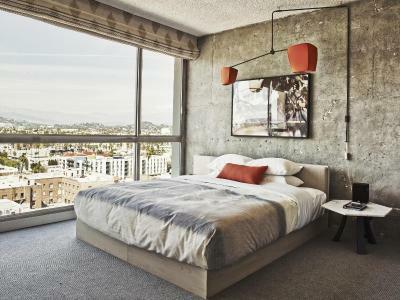 Located in a mid-century building less than 4 miles from Hollywood, the LINE Koreatown boutique hotel features free WiFi, an outdoor pool, a furnished sun terrace and three restaurants. 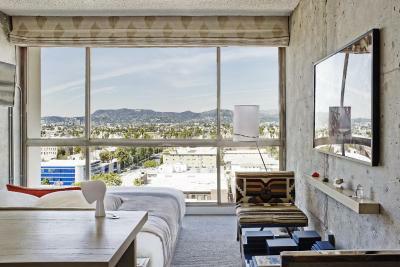 Floor-to-ceiling windows showcasing Los Angeles views, custom furnishings, modern artwork, a flat-screen TV and iPod docking station are included in every modern room at The LINE Hotel. A mini-bar with American and Korean snacks and beverages as well as an in-room safe are provided in each air-conditioned room. 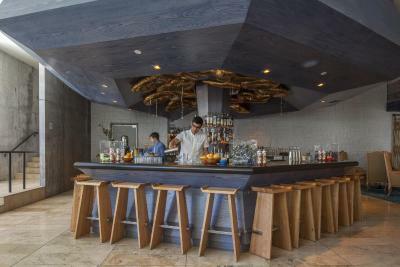 Openaire Restaurant offers poolside dining in the center of the Koreatown. The seasonal menu features ingredients from land and sea, provided in a shareable format. 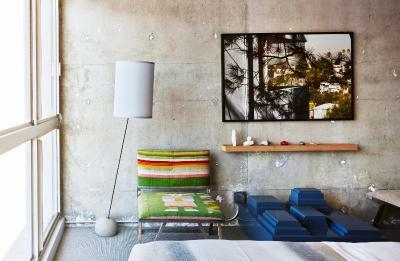 This hotel offers a retail store by art and design collective Poketo. 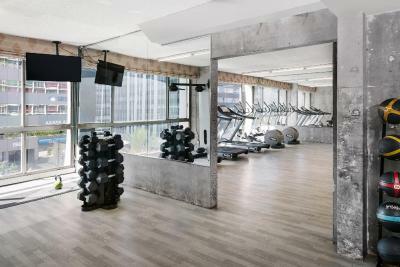 A fitness center is located on site and guests can hire bicycles to explore the surrounding area. Hotel guests can enjoy free yoga classes on Saturdays. 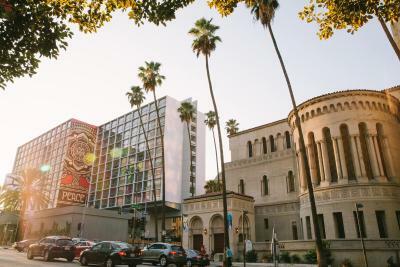 Located alongside Koreatown's pre-1940 brick colonial revival buildings, Staples Center, Los Angeles Convention Center and Los Angeles Memorial Coliseum are within 4 miles of this hotel. 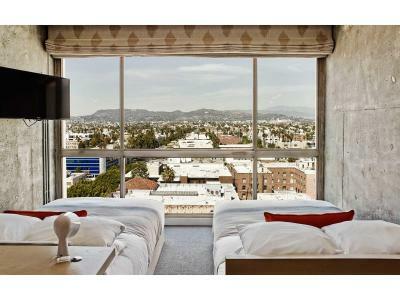 Surrounded by a number of late-night restaurants and bars, The LINE Hotel is less than 15 minutes’ drive from Beverly Hills and Universal Studios. When would you like to stay at The LINE Hotel? This room has floor-to-ceiling windows with views of the surrounding neighborhood. 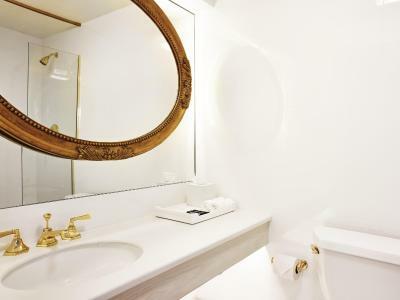 It features free Wi-Fi, original artwork, a large desk, additional seating, a flat-screen TV, a media hub and Baxter of California bath products. Private parking is available on site (reservation is not needed) and costs USD 45.10 per day. This room has floor-to-ceiling windows with views of the surrounding neighborhood. 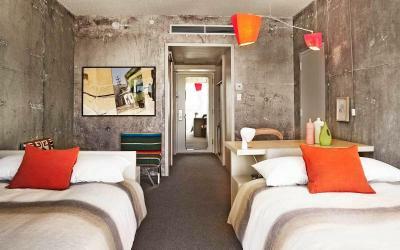 It features free Wi-Fi, original artwork, a large desk, additional seating, a flat-screen TV, a media hub and luxury toiletries. This room has floor-to-ceiling windows with views of the Hollywood Hills. 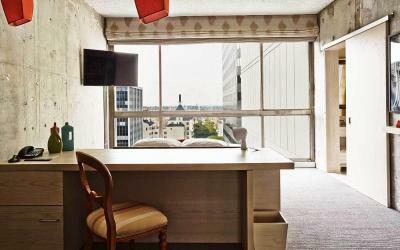 It features free Wi-Fi, original artwork, a large desk, additional seating, a flat-screen TV, a media hub and luxury toiletries. 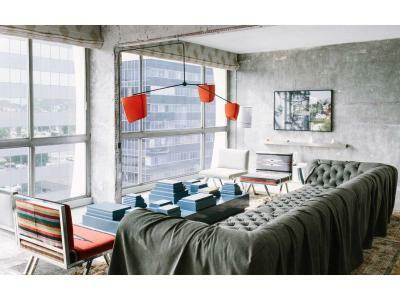 This large, corner studio features floor-to-ceiling windows with close-up views of Shepard Fairey’s Peace Tree Mural. 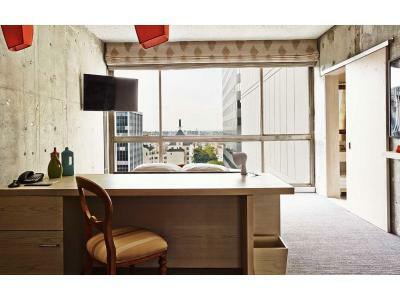 It features free WiFi, original artwork, a large desk, additional seating, a flat-screen TV, a media hub and luxury toiletries. 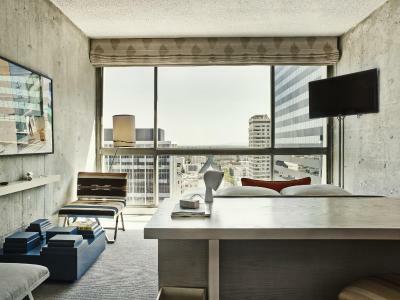 This suite feature floor-to-ceiling windows with city views. 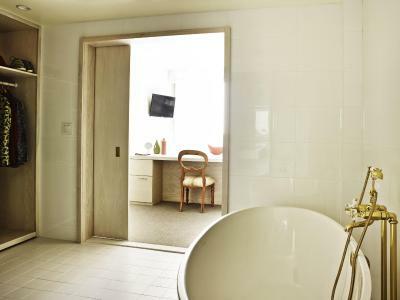 It includes a separate living area, a separate bedroom, free WiFi, a large desk with additional seating, a flat-screen TV, a media hub, original artwork, a coffee machine and luxury toiletries. House Rules The LINE Hotel takes special requests – add in the next step! The LINE Hotel accepts these cards and reserves the right to temporarily hold an amount prior to arrival. I was put in a room where there was a constant banging sound every few minutes. I’m not sure if it was construction? But it was loud enough to wake me up from sleeping. Also, I went to the pool for happy hour & was never served my drink & then the happy hour ended without me getting a drink. My room was extremely noisy. The windows did not seal well and let in a lot of street noise. I changed my booking months ahead of my check in date and booking.com did send the request to the hotel, but they claimed they never received it. I ended up being overcharged for a double bed room and now I have to go through the hassle of claiming the difference back. Any requests I did through booking.com (like early check-in time) never got a reply from the hotel. Not sure what happened there. Convenient location in Korea town. Lots of restaurants nearby. Loved the whole vibe of the place. Great location. Comfortable beds. I was assigned a room in a “quiet” section of the hotel, but upon arrival I noticed a ton of noise coming from the adjacent rooftop mechanical equipment. The front desk staff were great about switching my room. Difficult to get a pool sunbed on the weekend as it’s open to the public. All the taxes that get chucked on the bill came as a surprise. Also cigarette smoke permeating into the room from somewhere in the middle of the night. Rooms are not very well soundproofed, noisy conversation taking place at 1am in the adjacent room easy to hear. Rooms are super loud, couldn’t really sleep at night! Windows are not properly fixed. 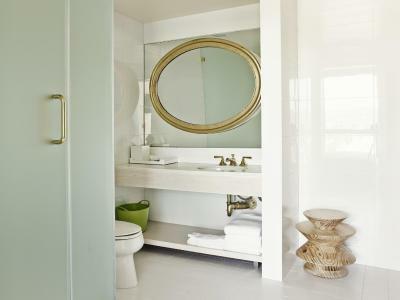 Rooms look much nicer and cooler on pictures but are much more basic, very small and simple in reality! Absolutely not worth the money!!! Stylish hotel und Lobby, cosy outside restaurant. 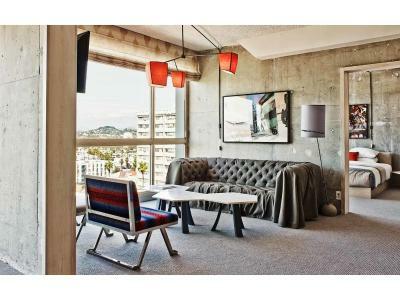 Rooms to hills side in upper floors look cool. Hotel protesters woke me up at 7am March 30. Not pleasant.